We Polish Greens have a small budget for our campaigns, and therefore specialise in cheap or free but eye-catching events, as well as inexpensive campaign material. Below are some ideas. The goal of an event is to be noticed and widely covered in the media, or to be seen and followed by as many people as possible – so outdoors, in crowded streets, or within demonstrations are good places for them. For it to be picked up by the media, the event must deal with an issue of current affairs, that is already the subject of media interest, or one that is linked in some way to a forthcoming anniversary or holiday, and which is certain to attract public interest. The place and time of the event should be convenient for journalists. Be sure to have a clear message that can be presented by journalists in one sentence. The event should be ‘good-looking’ and photogenic, so that newspapers will be interested in publishing photos and TV stations tempted to air a short video of the action. It ought to be unique, creative, funny… The media like conflicts that are easy to understand and present – e.g. groups of protesters and counter protesters. A good example of a successful happening is ‘Greedex’. In Warsaw, more and more public land is being sold to developers, who build closed-off, guarded, luxury housing estates. Public parks, and land next to lakes or on river banks, are being sold; the environment is being destroyed, and access to nature blocked off. Locals decided to protest against planned investments of this sort, and organised a joint demonstration in front of the city hall, which the Greens joined. To attract the media to this demonstration, we came up with the ‘Greedex’ event. We created a website belonging to a fake development company called ‘Greedex’. We published pictures of the company’s “planned investments” in the heart of historical Warsaw, in the city’s parks, even in the Royal Palace’s courtyard. Alongside the pictures were ironic texts, in which, for example, Greedex promised that, in its new housing estates, special birds will sing only during the hours that suited residents. From Greedex’s PR e-mail address, we invited the media to a press conference, “followed by sushi lunch”, at which the company would present its investment plans. The press conference was obviously set at the same time and place as the demonstration. We turned up dressed in suits and wearing pins with the ‘Greedex’ logo, pretending to work for its PR department. To our surprise, it was only once on the spot that many journalists understood it was a hoax. They were delighted by the idea and generously covered it. Some of them continued the story, writing “alarming articles”, only later revealing it as a joke, but one that tackled an important problem facing the city. 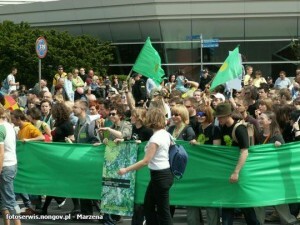 This happening triggered considerable debate about the power of private developers in Warsaw, and the sale of public land, often endangering unique natural habitats. 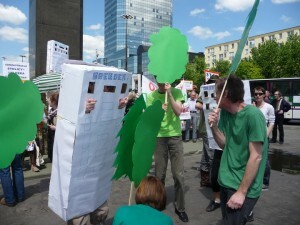 During the demonstration, we arranged a photogenic happening that could be filmed by TV crews: dressed as trees and buildings, we played out a ‘war’ between them – which the trees obviously won! Photos from the happening and ‘press conference‘. Allegro, the ‘Polish e-Bay’, allows fascist souvenirs to be sold. We co-organised an action tackling this problem. We created a new, ‘fascist’ logo for Allegro and disseminated it on the internet. It was also pasted to a billboard that was fixed to a car and driven through Warsaw. The action was so remarkable and effective that Allegro threatened us with legal proceedings for using their logo. The action is ongoing, while we wait for Allegro to finally change its policies. You can see photos from the action here. It is a good idea to organise city tours in eco-vehicles during elections (possibly in a public transportation vehicle, which both promotes public transport, and is useful to transport volunteers and material). A candidate can visibly visit his or her region and talk to the voters at different locations. The Polish Greens used a tram and the UK Greens an eco bus run on old oil. The Hungarian Greens organised a series of excellent events during their last election campaign. They formed photogenic geometrical figures out of people; others threw colourful balls; still others carried colourful sheets of paper…. They formed hearts, smiles, etc. By filming the action, they produced great, highly popular videos for YouTube. Sometimes we construct and use strange vehicles. Multifunctional banners are useful as well – they are ready plywood banners on a stick, with a nice frame and a logo. Inside the frame, we can place different A4-sized posters, depending on the occasion. Simple, no-logo green flags made of green material and light bamboo stick are just as useful as ‘professional’ flags (if the Greens are the only political party associated with the colour), but much cheaper. They are also useful during no-logo demonstrations (often organised by anarchists and groups that oppose political parties). Main campaign coordinator of Polish Greens, Zieloni 2004, in the local elections in 2010. Aleksandra has been working on Green campaigns since 2005, also in the UK (for Green MEP Jean Lambert in London during the 2009 European Parliament campaign). She studied at Warsaw University (MA in sociology and MA in Polish language and culture) and University College London.